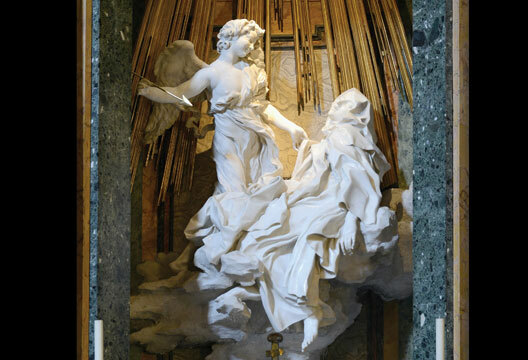 One of the most controversial representations of ‘emotion’ in history is Bernini’s sculpture of 16th-century mystic Teresa of Avila. It was used, for instance, by the French psychoanalyst Jacques Lacan on the cover of Encore (1975; translated 1998), and to illustrate his concept of jouissance (the kind of enjoyment that exceeds what can be put into words). Lacan was seeking to move beyond the existing interpretations of mystics as hysterics, which dated back to the late 19th century. Nonetheless, judging from Simon Schama’s comments on Teresa of Avila’s ‘emotional extremism’, and his suggestion that her raptures were perhaps ‘after all, the delusions of an unseemly hysteric’ (2006, p.111), it seems that the association between mystical experience and hysteria is still prevalent in modern British culture. The first modern scientific claim that Teresa of Avila had shown symptoms of hysteria was made by the Belgian physiologist G. Hahn (1883) at the time when the French neurologist Jean-Martin Charcot was producing photographs and drawings of the ‘great hysteria’, together with the artist-physiologist Paul Richer. Just over 100 years later, the philosopher of religion Christopher Bache challenged Hahn’s claim and questioned the excessive emphasis placed by the ‘psychological community’ on the symptoms of ill health displayed by Western mystics, arguing that we should look at their ‘signs of metahealth’ (1985, p.303). Bache drew on the findings of Stanislav Grof’s LSD-assisted psychotherapy from 1967 to 1973 to analyse Teresa’s autobiographical accounts of her fainting spells, heart and joint pain, mental confusion and ‘out-of-body experiences’ during prayer. Quoting her 1565 description of a five-hour episode of intense physical pain and restlessness, he suggested that it represented a ‘peculiar type of traumatic physical seizure often accompanied by powerful, disruptive emotions’ (p.300) and reached the conclusion that the ill health commonly reported by mystics was probably ‘perinatal in origin’ (p.313). One of the problems with Bache’s interpretation is that it made no reference to Teresa’s sociocultural context. His ahistorical analysis can be questioned in the light of more recent approaches to the study of emotion within psychology. For instance, the social psychologist Michael Billig (2002) suggests that we should not see emotions as ‘free-floating psychological impulses’, rather we should look at how they ‘exist within socially shared explanations’ (p.184). The historian of psychology Graham Richards (2005) also stresses the importance of looking at how emotions are given meaning and a structure by reference to observable ‘public-world phenomena’ and to the verbal categories available (pp.49, 52). In seeking to understand the emotions of people from other cultures or historical periods we need to take into account the words they use, and the beliefs and explanations valued in their specific social and historical contexts, even if we do not share them. Indeed, a common challenge in examining emotions from the past is the temptation to leave out the evidence that does not make sense according to our modern paradigms. This seems to be Bache’s strategy when citing Teresa’s reference to her ‘terrible pains and both inward and outward disquiet’ (p.300) out of context, omitting the lines in which she explains that she normally coped with such moments of intense pain by asking God to give her patience. On that particular occasion, she eventually saw beside her the devil as ‘a little creature, snarling like one in despair’, and this made her laugh and not be afraid (1976, p.265). Teresa’s account of how she eventually overcame her pain by trusting in God was not relevant for Bache’s purposes because he focused on potential resemblances between her narrative and the ‘metaphysical alienation, and existential despair endured by the LSD subject’ (p.310). Thus, while Teresa’s text locates despair outside her, in the little creature she visualises, and presents God as helpful and reassuring, Bache attributes to Teresa a negative experience of God and a sense of despair that can only be explained as fitting the picture he is seeking to reconstruct: ‘so deep is her sense of worthlessness and alienation that she succumbs to despair, experiencing God only as a vengeful tyrant’ (p.310). Three decades after the publication of Bache’s article, we have witnessed an upsurge of interest in wellbeing and in so-called ‘positive emotions’, like joy or happiness. What can we learn about joy from the accounts of mystics when they seem to have gone from extreme pain to utter bliss, and not experienced the more ordinary states of mind we associate with wellbeing? Or did they? If we are able to move beyond our inherited preconceptions about Christian mystics, we may discover in Teresa’s writings a remarkable emphasis on joy and cheerfulness. James Martin (2011) refers to her phrase ‘a sad nun is a bad nun’, though he does not dwell on the methods she recommended for maintaining a joyful or cheerful disposition. She left behind not only detailed accounts of the calm states of inner joy that can be attained through the practice of meditation, but also remarkable insights on the importance of spending time relaxing with other people (1980, p.69). According to the testimonies gathered by her earliest biographers, she actively encouraged the nuns in the small convents she founded to stay cheerful through recreation sessions in which they would make up poems and set them to music, using simple popular tunes (Carrera, 2009, pp.737–738). Such practices were in line with the then prevalent medical view that spending time with friends, singing and listening to stories or poems were effective ways of preventing or curing melancholy and maintaining good health. Besides recounting the kinds of experiences of pain on which Bache based his analysis, Teresa also used humour to point out to the women in her convents that, often, what prevented them from getting on with their duties was the fear of pain, rather than actual pain (1980, p.78). She suggested that they should complain less, and place less emphasis on seeking each other’s sympathy than on loving one another with ‘genuine love, and with passion’ (1980, p.64). She also encouraged them to laugh at themselves when thinking about the sadness they might have experienced in the past, if they had loved someone who had not loved them back. In contrast with the idea, still prevalent two centuries later, that a woman’s happiness was to be found in pleasing and consoling a good man, and making him happy (e.g. Rousseau 1762/1993, p.393), Teresa pointed out to the nuns in her convents that they were lucky not to have to make their happiness dependent on that of a man. In the practices of meditation she taught, they would focus their attention on what modern psychologists describe as ‘mood-congruent’ themes: if they were happy, they could visualise the risen Christ, and if they were feeling sad, they could think of the afflicted Christ on the eve of his Passion (Carrera, 2007). Today, Teresa’s poem ‘Let nothing upset you,/Let nothing startle you,/All things pass,/God does not change./Patience wins all it seeks’ is still cited, recited and sung in a multiplicity of languages and versions. Referring to the use of this poem as a song of hope among Latino immigrants in the US, Pim Valkenberg (2006) has argued that it promotes an active form of ‘patience’, which needs to be understood as a mixture of equanimity, perseverance and endurance. Just as Teresa learnt to deal with excruciating pain, and not be afraid of it, by asking God to grant her patience, believers and unbelievers in the 21st century may become better able to endure pain by looking outside themselves. Rather than simply looking at other people’s narratives and poems for evidence of ‘disturbing emotions’, as Bache does, it is worth considering how they might help us to rename and reframe the experience of ‘pain’ and ‘patience’, by looking at the values and beliefs that make them seem frightening, intolerable or tolerable. Five centuries after Teresa of Avila’s birth, her writings seem more relevant to psychologists than ever. In approaching them with the tools provided by discursive social psychology, we may not only be reminded of Richards’s warning that emotional experience cannot be separated from the words used to name it, and Billig’s invitation to consider socially shared explanations. We may also find compelling evidence to support the view, increasingly accepted in mainstream psychology, that fear, pain and joy are not separable from the beliefs, the social contexts and the material practices that shape them. Bache, C.M. (1985). A reappraisal of Teresa of Avila’s supposed hysteria. Journal of Religion and Health, 24(4), 300–315. Billig, M. (2002). Henri Tajfel’s ‘cognitive aspects of prejudice’ and the psychology of bigotry. British Journal of Social Psychology, 41, 171–188. Carrera, E. (2007). The emotions in sixteenth-century Spanish spirituality. Journal of Religious History, 31(3), 235–252. Carrera, E. (2009). Lovesickness and the therapy of desire. Bulletin of Hispanic Studies, 86, 729–742. Hahn, G. (1983). Les phénomènes hystériques et les révélations de Sainte Thérèse. Brussels: Vromant. Lacan, J. (1998). On feminine sexuality: The limits of love and knowledge (Ed. Jacques-Alain Miller). New York: Norton. Martin, J. (2011). Between Heaven and mirth: Why joy, humor, and laughter are at the heart of the spiritual life. New York: HarperCollins. Richards, G. (2005). Emotions into words – or words into emotions? In P. Gouk & H. Hills, (Eds.) Representing emotions: New connections in the histories of art, musicand medicine. Aldershot: Ashgate. Rousseau, J. (1993). The social contractand discourses (Trans. G.D.H. Cole). Clarendon, VT: Everyman. Schama, S. (2006). The power of art. BBC books. New York: HarperCollins. Teresa of Avila, St (1976). The book of her life. In Collected works, Vol. 1 (pp.5–365). Washington DC: ICS. Teresa of Avila, St (1980). The way of perfection. In Collected works, Vol. 2 (pp.15–204). Washington DC: ICS. Valkenberg, P. (2006). Sharing lights on the way to God: Muslim-Christian dialogue and theology in the context of Abrahamic partnership. Amsterdam/New York: Rodopi.